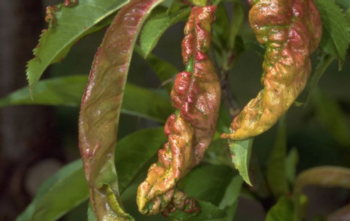 Peach leaf curl is caused by the fungus Taphrina deformans and occurs wherever peaches are grown. The fungus causes the growing cells at the leaf margins to multiply quickly and randomly, which results in the puckered, curled, distorted appearance. Often times the color of the leaves vary from shades of green and yellow, to pink, orange, and purple. Spores are produced on the surface of the leaf as the leaf matures. Peaches and nectarine both are affected by this fungus. When warm weather hits, somewhere at or above 79 to 87 degrees, the disease stops. That doesn't mean the fungi went away, though. Marin's maritime influence and abundance of untreated and infected home fruit trees create the perfect conditions for peach leaf curl, especially if we have had some late cooler wet rains. Removing infected growth before ascospores — microscopic spores that develop during the winter on infected dead, fallen leaves — emerge helps. For most home gardeners, store-bought copper fungicide products are the easiest to use. In Marin's climate they require at least three applications from Thanksgiving to Valentine's Day to be effective. Add a little horticultural oil or a sticker adjuvant to increase efficacy. The right time to start a copper fungicide treatment program is in the late fall or winter. Prune peaches hard and follow with good sanitation and a fungicide application to the point of runoff. Keep in mind that copper can kill important soil fungi. Soak the tree, but try not to soak the ground. A spring application is advised at bud swell, about two weeks before bloom, but is not effective after bloom. Never spray when trees are in bloom or when bees are present. Plan now and hopefully next spring, your peach and nectarine trees will win the battle.